Selling is thought of as a part of marketing, however, the two disciplines are completely different. The sales discipline often forms a separate grouping in a corporate structure, employing separate specialist who use the art of persuasion to sell products. Contrary to popular belief, the methodological approach of selling refers to a systematic process of repetitive and measurable milestones, by which a salesperson relates his or her offering of a product or service in return enabling the buyer to achieve their goal in an economic way. Outdoor advertising can provide enormous service to a company’s sales time by providing a media platform that can efficiently and cost-effectively communicate to consumers. 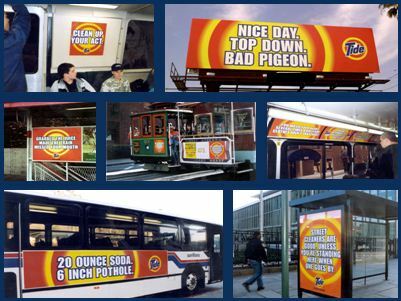 Outdoor advertising sells products. Ninety percent of motorists depend on outdoor to provide helpful information for locating services such as gas, food and lodging, as well as retail outlets and tourist attractions. One out of every five dollars spent in outdoor is for travel and tourism. Typically, five to ten percent of jobs in a community come from businesses advertising in outdoor media. Outdoor is essentially a local ad tool (70%) strongly rooted in local economy, and it enables small businesses — the infrastructure of a community and the jobs engine of its economy – to connect with consumers. For businesses in some small towns without a paper or local TV station, outdoor is the only local ad medium available to reach the public. Outdoor reminds consumers that a brand is a good choice when the public is ready to purchase. Contemporary social trends favor outdoor. It provides quick information to help busy, mobile individuals on-the-go make purchase decisions. The segment of the population that will encounter interactive ad technology is highly mobile, technologically sophisticated, and likely to find the cutting edge outdoor technology exciting as well as useful. For the past two months, 25 digital billboards across the mid-Atlantic have been displaying a personal plea from Aretha Swift, an Abington, Pa., mother of three who is seeking an organ donor.Thanks to the campaign, five benevolent strangers have come forward. The would-be donors have already submitted their medical paperwork and agreed to undergo testing to see if they are a match. Overall, the campaign attracted attention from more than 30 media outlets, brought 1,521 unique visitors to Swift’s website and motivated 21 inquires from people interested in donating a kidney. The campaign lasted from June 1 to July 31. Last Thursday, Swift met with two Philadelphians and one man from Norristown, Pa., who are potential donors. Bartkowski was in charge of setting the meetings up. “[Thursday] was such a full day for me, it was overwhelming and awesome,” said Swift, who has been undergoing dialysis three days a week. Of the five potential donors, three are women and two are men, ranging in age from their late 20s to late 50s. Geographically speaking, four of the five are from the greater Philadelphia area and one is from Virginia, but is a Philadelphia native. “By having more than one person, it increases [Swift’s] chances,” said Thaddeus Bartkowski, a business owner who coordinated the billboard campaign. The billboards were donated by outdoor advertising companies. Bartkowski, who operates Catalyst Outdoor Advertising, came up with the idea for the campaign and persuaded other business owners to participate. The billboards were visible as far north as Times Square in Manhattan, along the Jersey Shore, throughout the Philadelphia suburbs and as far west as Reading, Pa.